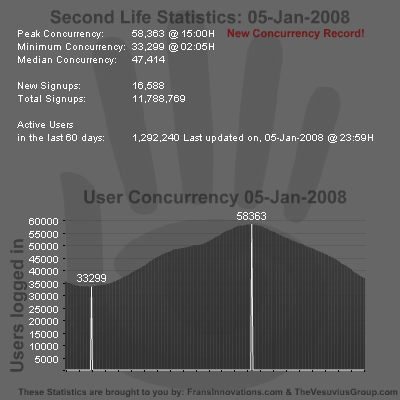 Peak concurrency grew 336 users, a increase of 0.54%. Minimum Concurrency dropped 870 users, a decrease of 2.53%. Median Concurrency grew 694 users, a increase of 1,94%. Yesterday was another record peak concurrency, though barely, despite Intermittent asset server issues and Login Difficulties. As you can see in the graph Second Life was even closed for all residents for a while. Hopefully Wednesdays update will help prevent these issues. Yesterday had a Record peak concurrency, usually Sundays has the highest concurrency of a week, so who knows, we might break 60k today. Peak concurrenct of 42k+ For Second life. It took longer then I expected, but the peak concurrency of Second Life has today for the first time gone over 40k, to be precise the max concurrency was 42.285. I actually logged in to see how the grid was behaving and everything seemed to be doing fine, all the searches worked, profiles loaded, scripts uploaded and objects rezzed from inventory. Even sim border crossings where causing no extra troubles. Only thing that didn’t load for me was my friendslist, which I understand is a the cause of a bug and not due to the high peak concurrency. I was just to late for a picture of the peak. Makes you wonder why on other days the grid is behaving so poorly? Are there still some unknown factors in the system, or are Sunday users just less demanding of the system?